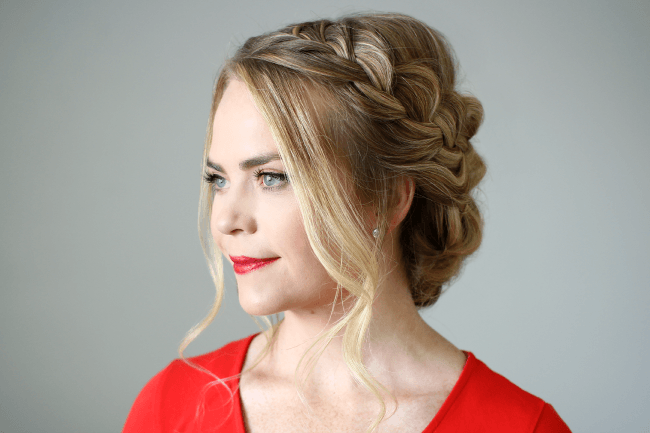 This braided updo is so soft and feminine you will feel like a princess wearing it. It is so dressy it would look perfect for a night out or a special occasion. Of course you could wear it casually just for the fun of it. I think it would look perfect for a school dance which I know is coming up soon now that school has started! Love this look? 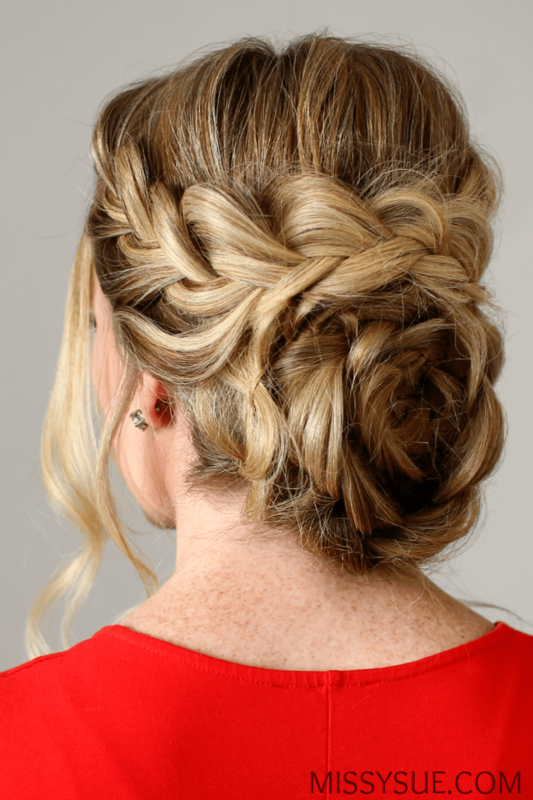 Check out these other two braided updos! Step 1 / Divide the hair into four vertical sections. One on the right and left side of the head, and the back section into two halves. 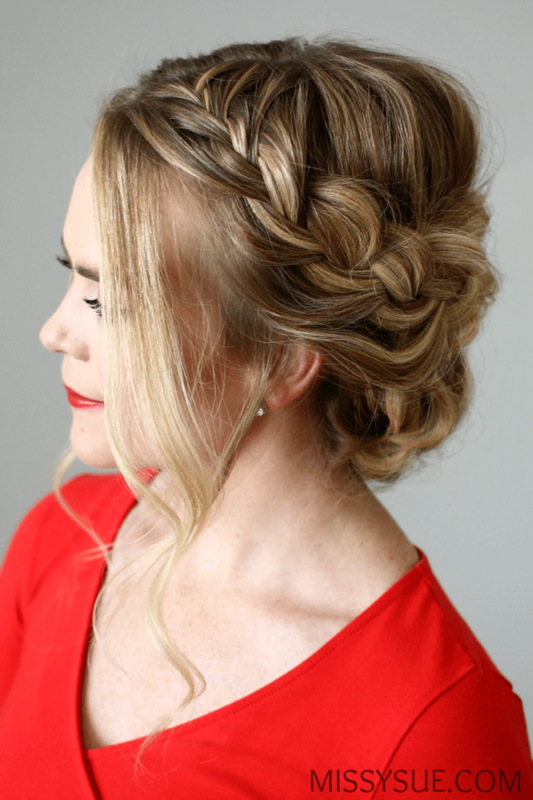 Braid each section at the back into a regular braid and tie off each one with a clear elastic band. Step 2 / Take the section on the right and braid it down into a regular braid as well. Tie off the end with another elastic band, then gently pull on the edges of the braid to make it flat and wide. Step 3 / With the remaining section on the left side, braid the hair into a french braid until it reaches the left ear. Then finish braiding the section in a regular braid. Tie off the braid with a clear elastic band and pull the braid wide and flat like in the previous step. Step 4 / Working with the back two braids, take the braid on the right and wrap it upwards, then spiral it clock-wise into a bun with the end of the braid (and elastic) wrapping into the center. Step 5 / Pin down the edges of the braid to keep it secure. Use as many bobby pins as you need until it feels snug against the head. Step 6 / Take the other braid, at the back of the head, and wrap it, counter-clockwise, around the outer edge of the bun created in the previous two steps. Step 7 / Pin down the edges as well so it is secure. Step 8 / Next, take the braid from the left side, wrap it over the top of the bun and around the left side. Step 9 / Tuck the end underneath the bun and pin it with bobby pins. Step 10 / Now take the remaining braid on the left side and wrap it over the bun. Step 11 / Wrap the braid around the right side and pin the end underneath the bun. Step 12 / Spray the style with a firm-hold hairspray and smooth down any flyaways. Thank you so much for sharing this flower braid updo!